Firstly, thank you Clothes Show for inviting me! I did not know I could apply for a press accreditation until I received an email inviting me to apply! Which then was passed! So I am very thankful to have received this opportunity as I loved every moment of it! 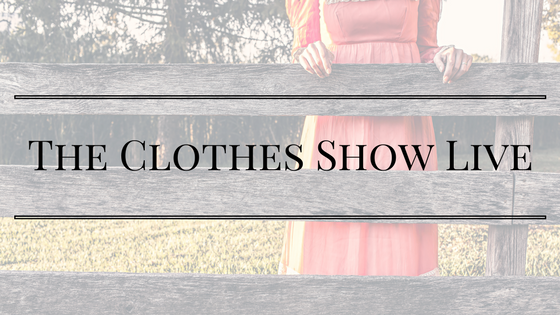 Okay, so 2016 is the final year for The Clothes Show in Birmingham. From July 2017, it is moving to Liverpool! Luckily I am not too far from Liverpool when I am back home so I will be attending again! I decided to go on Sunday. I actually didn't get to the NEC until 12 noon as I had a late night on Saturday doing uni work and by the time I got ready in the morning I was running late. Finding a parking space didn't help either and delayed me further! However I managed to get there with just about enough time left. I first went to the press office and got my badge. Then headed to do some shopping! I looked around all the stalls and loved everything! The trendy outfits, modern jewellery and just seeing blogger favourite brands made my day! I purchased the Sensationail Scarlet Red Starter Kit with two polishes, Cocowhite oil pulling kit x2 and Nanshy professional brush set. I will be posting reviews of these products once I have tried them for a good 2 weeks or more so watch this space! I also received a bloggers goody bag from the press accreditation organisers which included wrap around wrist headphones, coffee face mask, Nanshy eye liner brush and a few more items which was very generous of them! Now the spectacular moment of the day was the catwalk show! The atmosphere was amazing, we had really good seats and a great view. I loved all the new clothes which are coming out for this upcoming season and can't wait to pick up a few pieces. So did anyone else go to The Clothes Show this year? If so how was it?! Will you be joining in Liverpool next year? Let me know your thoughts below!